Concrete brings to mind boring gray driveways and dull sidewalks. But it doesn’t have to be the drab and utilitarian surface that has earned it the stereotype. Concrete flooring overlays can give the surface a glossy surface that can make kitchens seem more sophisticated or business lobbies seem more professional. These concrete floor coatings can also protect the surface so that it is not easily damaged and it lasts much longer, helping the property owner to save a lot of money on repair or replacement over time. Pavers can be used to create a truly opulent driveway or walkway. But have you ever priced out a driveway made entirely of stone pavers? Even with the lowest-priced pavers, you will end up paying several times more than you would for a concrete driveway. You can get the same look as natural stone with the right concrete overlays. Concrete floor overlays in Scottsdale can be stamped, stained, and textured, allowing them to take on the look of just about any type of stone. You can transform your driveway to look like it is made of real flagstone, cobblestone, slate, or brick. You can do the same for your outdoor walkways and patio, creating a more cohesive look for your home and instantly increasing your property’s curb appeal. Hardwood floors are beautiful, but they can also be quite expensive and difficult to maintain. They are easily scratched or scuffed, and they often suffer water damage. So while you might want wood floors for your home, you may not want to invest the time and money it takes to get them and maintain them. Fortunately, you can get the same look with concrete floor overlays. It’s amazing how the right choices for concrete floor coatings can transform a dingy floor and make it look like a warm, rustic barn floor or even an old Victorian manor. You need to hire an experienced and skilled floor coatings contractor to get the right look. The contractor should not how to choose the right formula, the right colors, the right mixes, and so on to get the look just right. Many businesses have boring tile or laminate floors or, worse, parquet carpets. The best most businesses strive for seems to be “not terrible.” There’s very little personality in the flooring choices, which makes for a wasted opportunity. Businesses should use their décor choices to express more about their brand values and to let customers know what they can expect in the service. If the floors are basic, the business might be sending the message that their service is basic or that they put in only the minimal effort on their product, such as cutting the same corners on costs. You can achieve some beautiful floors with concrete overlays. Besides the paver and wood options discussed above, you can also create colorful designs. For example, if you have a candy store or bakery, you can get a colorful swirl spiraling out from the center of the room. The concrete overlay will last longer than simple paint because it bonds to the surface and is resistant to wear. Concrete flooring overlays in Scottsdale are more than protective coatings. The right overlays can also enhance the décor or achieve an amazing transformation for the space. Work with a floor coatings contractor to explore what’s possible for your indoor concrete floors, driveway, walkway, or other concrete surfaces. 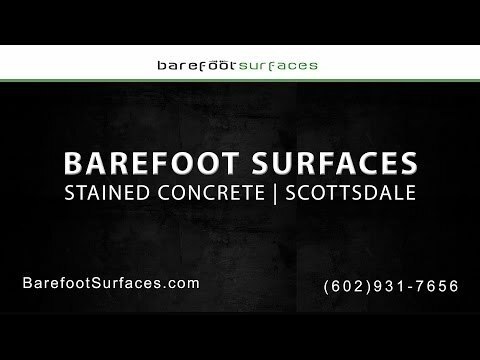 Barefoot Surfaces in Arizona is ready to help. We are the go-to floor coatings contractor for Arizona home and business owners, and we install all types of epoxy floor coatings, including concrete overlays, metallic epoxies, garage floor coatings in Scottsdale, and more. Our contractors properly prepare the floors and install concrete floor coatings so that they provide many years of protection and. They also help you decide what choices will enhance the look of your concrete surfaces for optimal effect. Contact us in Arizona today to learn about the options for concrete floor coatings and to schedule an estimate.